Ghosn at a news conference today to announce Nissan's purchase of a controlling stake in Mitsubishi. TOKYO -- Carlos Ghosn officially folded troubled Mitsubishi Motors into the Renault-Nissan alliance and appointed himself chairman, forecasting nearly half a billion dollars in savings as soon as next year as the group joins a small club of automakers operating at a massive scale. Nissan Motor Co. and Mitsubishi outlined plans to reap combined savings of 49 billion yen (US$473.2 million) in the next fiscal year through joint manufacturing, product sharing, combined purchasing and other combined operations that spread costs over a higher volume of vehicles. The tie-up, finalized on Thursday when Nissan completed its 237 billion-yen (US$2.29 billion) purchase of a controlling 34 per cent stake in Mitsubishi, also unleashed a cascade of executive changes. Ghosn said he asked current Mitsubishi Chairman and President Osamu Masuko to stay on as president of Mitsubishi, even though Masuko will relinquish his title of chairman to Ghosn. Because Ghosn will be wearing his third hat as chairman – after identical roles at Renault and Nissan – he also appointed Nissan Vice Chairman and Chief Competition Officer Hiroto Saikawa as his co-CEO at Nissan. Ghosn will continue to serve as CEO and chairman of both Renault and Nissan. As part of the tie-up, Ghosn appointed three other Nissan executives to a downsized 11-member Mitsubishi board. Nissan will also install its pillar executive Trevor Mann as Mitsubishi’s new chief operating officer. Mann will leave his post as chief performance officer at Nissan. Filling Mann’s role as chief performance officer will be Jose Munoz, who currently serves as chairman of Nissan’s North American operations. Munoz will do double duty in both roles. Also at Nissan, Alliance Executive Vice President of Purchasing Yasuhiro Yamauchi will take Saikawa’s position as chief competitive office. Veronique Sariat-Depotte was promoted to take Yamauchi’s old role and will head the Renault-Nissan purchasing organization. The board changes must still be approved in December by Mitsubishi shareholders. Masuko said the savings would start almost immediately, with 25 billion yen (US$241.4 million) in annual synergies kicking in from fiscal year 2017. The savings will boost Mitsubishi’s operating profit margin by as much as 1 per centage point in the first year of the tie-up, by 2 per centage points in the second year and by more than 2 points in the third year, he forecast. For Nissan, Ghosn said the company will generate savings of 24 billion yen (US$231.8 million) in the next fiscal year and then 60 billion yen (US$579.4 million) the following fiscal year and beyond. Masuko and Ghosn outlined several areas of cooperation, including joint production and purchasing, platform sharing and technology development. Nissan will begin selling a rebadged Mitsubishi minivan in Southeast Asia, and Mitsubishi’s plug-in hybrid system will become the alliance standard. They may also pool resources when buying raw materials. Mitsubishi will also tap Nissan’s retail financing service overseas to boost sales. “What we see today is low hanging fruit. And it’s already massive,” Ghosn said of the opportunities to share costs. Mitsubishi hasn’t even begun accounting for possible synergies with Renault, he noted, adding that full integration into the alliance will generate more. In gambling on Mitsubishi’s rebound, Ghosn says he is convinced the promise of massive joint savings outweighs any lingering risk that skeletons still lurk in Mitsubishi’s closet. Ghosn bets he can repeat the revival magic he worked at Nissan with what is arguably Japan’s most beleaguered auto brand. He will get in-house help from Masuko, another restructuring pro. Masuko, who drove Mitsubishi to record profit after years of losses, was in the midst of his own restructuring push, when the company’s faked fuel economy scandal derailed his plans. The task of rebooting troubled Mitsubishi and melding it into the Renault-Nissan Alliance now puts the two veteran revival artists to the test. Ghosn said Masuko had wanted to resign to take responsibility for Mitsubishi’s fuel economy scandal. But Ghosn said he insisted that the Mitsubishi executive stay on to lead the revival as a condition for Nissan’s help. For Ghosn, the balancing act is especially tricky. He will serve as the chairman of three global automakers simultaneously. He already chairs Nissan and Renault. The Nissan-Mitsubishi deal was originally announced in May, and Nissan sealed the purchase only after months of due diligence into Mitsubishi’s finances and operations. Nissan said in May it aimed to complete the acquisition by year’s end. The partnership builds on enormous economies of scale already delivered by the Renault-Nissan alliance, as Ghosn looks spread the increasing cost of developing next-generation green cars, advanced safety and telematics systems and autonomous driving technologies. 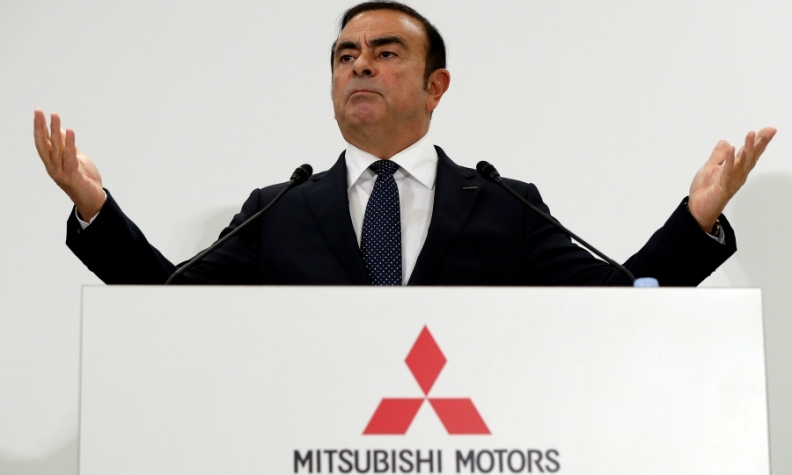 Ghosn said adding Mitsubishi will lift the alliance, in conjunction with its Russian partner AvtoVAZ, into an exclusive club of mega-automakers churning out 10 million vehicles a year, alongside Japanese rival Toyota Motor Corp. and Germany’s Volkswagen Group. It also splits Japanese automakers into three loosely aligned camps as rivals consolidate to survive in an increasingly competitive global environment. Nissan and Mitsubishi are in one group, while Toyota teams with Subaru, Mazda, Daihatsu, Hino, Isuzu, and most recently Suzuki. Meanwhile, mid-sized Honda remains independent without a Japanese partner. After announcing the acquisition in May, Nissan sent former Nissan Executive Vice President Mitsuhiko Yamashita to lead Mitsubishi’s product development department, ground zero for the faked fuel economy tests that forced Mitsubishi to suspend sales and idle output in Japan. A day before announcing completion of the tie-up, Mitsubishi widened its net loss forecast to 240 billion yen (US$2.32 billion) for the current fiscal year ending March 31, 2017. It had earlier predicted a smaller net loss of 145 billion yen (US$1.40 billion). It would mark Mitsubishi’s first full-year net loss since the fiscal year ended March 31, 2009. Mitsubishi blamed the worsening outlook partly on weak demand in emerging markets and increased costs of suspending its Mizushima assembly plant during the fuel economy flap. As chairman, Ghosn may draw on the restructuring playbook he used after being dispatched from Renault to then-troubled Nissan in 1999. He soon earned the nickname “Le Cost Killer” for whipping the financially-stricken carmaker back into shape by closing factories, sourcing parts on a more competitive basis and by sharing costs with its French partner Renault. Keeping Masuko on board will leverage his experience as a long-serving top executive who piloted Mitsubishi back from years of losses. Masuko was in the middle of reposition the brand around electrified vehicles, utility vehicles and emerging markets, when the scandal hit. Advantageous foreign exchange rates helped get Mitsubishi back on track. But Masuko also scaled back production to match slumping demand and slashed costs including r&d spending while channeling the remaining resources into next-generation fields such as electrified cars. Masuko also shuttered the company’s Normal, Illinois, factory in the U.S. – it’s only North American assembly plant. The plant had been operating far below capacity for years. Ghosn’s strength is being able to cut through the political rivalries of internal fiefdoms, as he successfully did in merging the dramatic different cultures of Renault and Nissan, Richter said. Yet, big challenges abound. Mitsubishi’s sales are heavily reliant on emerging markets, such as Southeast Asia and Russia, that are slugging through a prolonged slump. Then there is an ossified corporate culture that an outside commission found contributed to the fuel economy scandals. Mitsubishi’s woes were compounded by a lack of communication between departments and a habit of cutting corners to meet overly ambitious goals. Mitsubishi’s shriveled r&d budget didn’t help. Nissan plans to spend nearly six times as much as Mitsubishi on r&d this fiscal year. In April, Mitsubishi admitted that it had rigged fuel economy tests of some 624,000 minivehicles sold in Japan. They included some 468,000 vehicles manufactured by Mitsubishi but badged and sold as Nissans. Mitsubishi’s image suffered another blow when it later said it used improper testing procedures on several other vehicles as well. For Mitsubishi, the partnership provides a stable source of cash and corporate management from Nissan that may help restore its tarnished reputation. The struggling carmaker may even get a badly needed influx of new product for the U.S. to help shore up a fledgling recovery there. For Nissan, tapping Mitsubishi’s solid sales network in Southeast Asia could help Nissan in a market where it has failed to gain traction. Additional supply of vehicles to Mitsubishi would also help Nissan achieve higher volume in an era when economies of scale is the new mantra. Another area of possible cooperation includes pickups, said Mark Fulthorpe, director of light vehicle production analysis at IHS Markit. But don’t expect immediate gains from joining hands. “One of the keys to making this succeed is how quickly can we see the transference of the Mitsubishi future programs onto Renault-Nissan alliance platforms,” Fulthorpe said. Nissan must also preserve its Japanese minicar partnership with Mitsubishi, no matter how strained, because the segment accounts for about 40 per cent of local sales. Nissan abandoned its own minicar business and threw its lot into a joint minicar venture with Mitsubishi in 2010. Of the Mitsubishi Group companies, Mitsubishi Heavy has the biggest stake with 20 per cent. Trading company Mitsubishi Corp. holds 10 per cent, while the Bank of Tokyo-Mitsubishi UFJ owns 3.9 per cent. Under Japanese law, a one-third stake holding is enough to give a shareholder veto power over board decisions. Nissan's 34 per cent stake would suffice. Nissan is Japan's second-largest automaker by sales. The deal would give Nissan a bigger stake in Mitsubishi than its 15 per cent holding in alliance partner Renault. The French automaker holds a 43.4 per cent stake in Nissan.